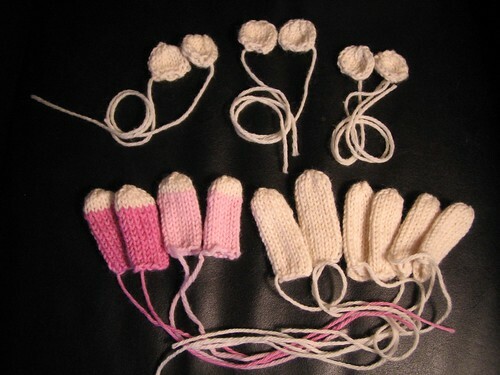 Haven't done as much knitting this week as I would have liked. Some weeks are just like that, I guess. These are the extremities for the little bears that I need to make for the December newborns. Don't they look all grisly** when they're reduced to just parts??? those parts look like they could do double duty at.... guess where? i won't be all suggestive, but maybe you can guess where my mind is? I don't know Bekka do you think that Bubba is a pink kinda guy? Or maybe you were talking about the little, um ears, for LLA's use?? Hahahahah!